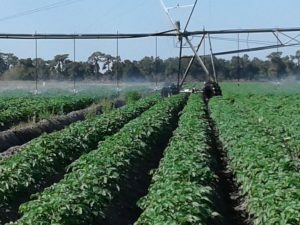 Fertigation on a commercial potato farm can reduce water and fertilizer use. Seepage irrigation has been the most commonly used irrigation method for potatoes since the crop was first grown in Florida in the late 1800s. This traditional irrigation method doesn’t require much investment by the grower. Seepage irrigation waters the crop from the bottom by raising the water table, but it lacks water-use efficiency. Potatoes generally use 20 inches of water on average during the 100-day growing season. Crop production is a large consumer of freshwater. Currently, approximately 70 percent of Florida’s freshwater is consumed by agriculture. Florida is predicted to face water shortages in the near future. As crop production is the primary water user, conservation agriculture is imperative. After completing a 3-year, on-farm research project in Southwest Florida, University of Florida researchers found that sprinkler irrigation (overhead irrigation) via center pivots is much more efficient in water use than seepage irrigation. The overhead irrigation used only 8.5 inches of water on average in the same location in the same growing seasons. The farm has saved more than 2.3 billion gallons of irrigation water since 2012, which is enough water to supply all residents living in Gainesville, Florida, for more than six months. Unlike seepage irrigation, overhead irrigation waters potatoes from the top. The traditional fertilization method is to apply dry granular or liquid fertilizers through applicators. Potato growers usually apply phosphate fertilizers one time pre-plant, and nitrogen and potash fertilizers two times for table-stock potatoes pre-plant and at emergence. For chipping potatoes, one additional application of nitrogen and potassium is applied at layby approximately five to six weeks before harvesting. This fertilizer program used for seepage irrigation may be fine, but is not suitable for overhead irrigation because nutrients, particularly nitrogen, are easily washed away from the root zone of the crop. Therefore, with the change to overhead irrigation, the fertilizer application method needs to be adjusted accordingly. 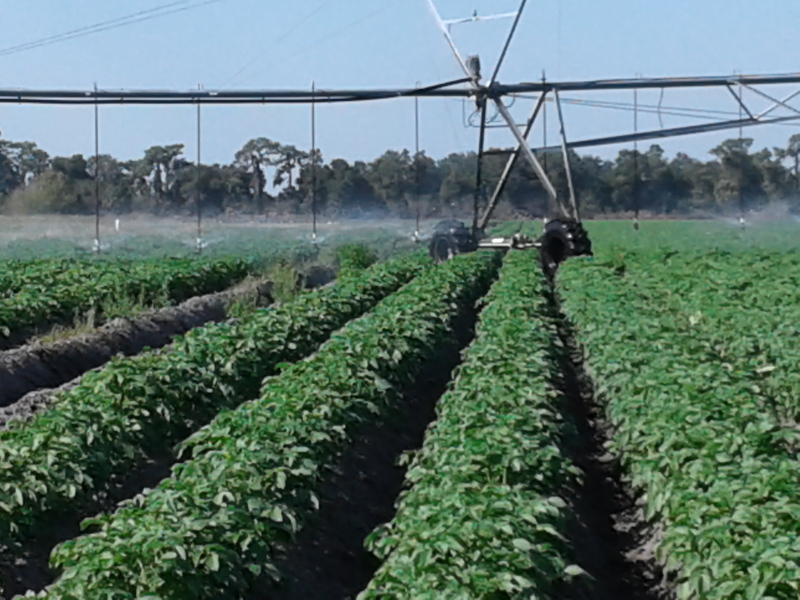 A 4-year project aimed at saving both nutrients and water is taking place on the same commercial potato farm in Southwest Florida. A new fertilizer program has been developed and employed for the project with both dry granular fertilization and fertigation. Fertigation is the injection of liquid fertilizers into the overhead irrigation system. The new fertilizer program includes 100 percent phosphorus, 25 percent nitrogen and 25 percent potassium applied pre-plant, and 50 percent nitrogen and 50 percent potassium at emergence. The other 25 percent nitrogen and 25 percent potassium were applied through irrigation with five weekly fertigation events starting four weeks after emergence. 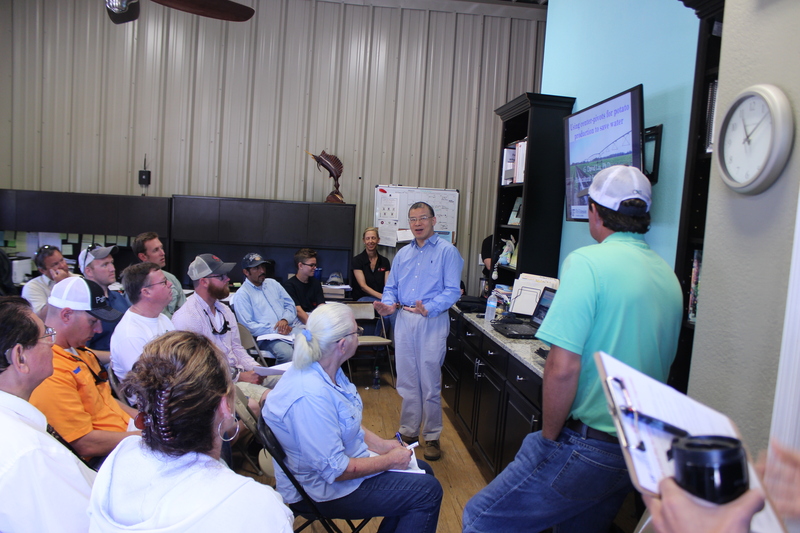 The data collected from the project showed that fertigation saved more than 20 percent of fertilizers when compared to dry granular fertilization. The owner of the farm says 25 percent less fertilizer is needed by using this new fertilizer program. Why can this new program save so much fertilizer? The traditional fertilizer program basically applies all of the fertilizers upfront. It is relatively fine for seepage irrigation, which irrigates the crop from the bottom and can keep the nutrients in the root zone relatively longer. When overhead irrigation is adopted with upfront application of the fertilizers, sandy soil is poor at holding the applied nutrients in the root zone. Thus, in the late growth stage, the crop doesn’t have enough nutrients for tuber bulking and development. Potato tubers then get smaller, and yield becomes lower. 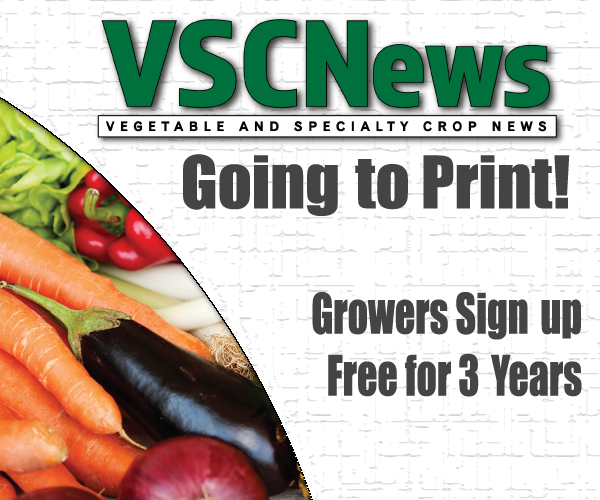 The new program can fertilize the crop at the right time. In other words, fertigation can minimize nutrient leaching and synchronize the nutrient supply and requirements of the crop. Guodong Liu conducts a fertigation demonstration at a farm. Irrigation and fertilization work hand-in-hand. Because the new fertilizer program with fertigation can provide the nutrients at the right time and synchronize both nutrient supply and requirements, research results showed that the tuber yield was increased by 20 to 27 percent. Fertigation uses the irrigation system as an applicator for liquid fertilizer. An advantage of fertigation is labor savings because growers don’t need to drive fertilizer applicators into the field. Another advantage is increased nutrient-use efficiency because once-a-week application ensures the plants take up the nutrients before they are leached away, minimizing plant damage. For chipping potatoes, growers usually add an additional fertilizer application at layby when the potato plants are all tall adults. The plants are likely to be damaged when a grower drives a tractor through. Minimizing plant damage may be one of the reasons for a greater tuber yield with the new program. As a predicted water-shortage state, Florida needs to develop conservative agriculture, particularly fertigation, to minimize the usage of water and nutrients and maximize potato tuber yield. The results of the ongoing research projects show that fertigation can significantly save water and nutrients while maximizing potato yield. As Florida’s population and water needs are both rapidly rising, efficient use of water and nutrients becomes a must for economic growth and environmental sustainability. Fertigation may be the future for potato production. Guodong Liu (guodong@ufl.edu) is an assistant professor in the Horticultural Sciences Department at the University of Florida Institute of Food and Agricultural Sciences in Gainesville.